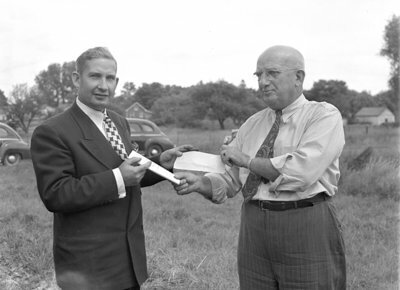 Black and white negative showing Nathan Lieberman (left) and Whitby Mayor Robert Deverell at the sod turning ceremony for the Natlie Knitting Mills. The two men are agreeing to the contract. Natlie Knitting Mills Officials, 1946, Marjorie Ruddy, Whitby Archives, 15-014-003.